Cite page (MLA): Ward, Megan, and Adrian S. Wisnicki. "Field Diary I: An Overview." In Livingstone's Final Manuscripts (1865-1873). Megan Ward and Adrian S. Wisnicki, dirs. Livingstone Online. Adrian S. Wisnicki and Megan Ward, dirs. University of Maryland Libraries, 2018. Web. http://livingstoneonline.org/uuid/node/11835b50-66a9-48bd-b340-9bc19da83bd7. This page introduces Field Diary I, which is part of our critical edition of Livingstone's final manuscripts (1865-73). The essay walks through the key narrative events in the first two-thirds of the diary, then enumerates some of the information captured in the diary's last third. The essay concludes by discussing some of the diary's prominent material features. The first of Livingstone’s field diaries from his final expedition to Africa (1866-73) begins with Livingstone’s departure for Africa from France. Livingstone opens with a series of addresses in French, noting that his daughter Agnes will remain in Paris to practice her French. Livingstone travels from Marseilles to Malta, where the ship is quarantined due to cholera. They then sail to Alexandria, Egypt, then overland to Cairo, then on to the Gulf of Aden and from there to Bombay, India. Images of two pages of Field Diary I (Livingstone 1865:, ). Copyright David Livingstone Centre. Creative Commons Attribution-NonCommercial 3.0 Unported. The page at left (top in mobile) represents a typical page of the diary. The image at right (bottom) records payments made by Livingstone, but is notable for the presence of a small insect pressed onto the page. Once in Bombay, Livingstone is reunited with his “men from the Zambesi,” the porters he left in Bombay before returning to England on a previous trip (Livingstone 1865:). He also sells the Lady Nyassa, the steamer he built and sailed to Bombay with those same men. While in Bombay, Livingstone records observations of the British colonial community in Bombay and gives several lectures, all the while drumming up support from the Sultan of Zanzibar and looking for additional men to go on with him to Africa. In January 1866, he sets sail for Zanzibar and in March 1866, continues on from Zanzibar to Rovuma, on the western coast of Africa. This is where the narrative account ends. From here, the notebook shifts from narrative descriptions to a more dispersed set of notations, written with the book flipped upside-down. In the final third of the diary, we find a few figures, such as a genealogical chart, a map, and a drawing of ship’s prow. In addition, there are wage calculations for his porters and records of local measures, such as “Gora – 15 cloths of 4 cubits each” (Livingstone 1865:). These are interspersed with quotations from British explorer and Livingstone’s predecessor John Hanning Speke (1827-65), noting that Speke was unable to “converse in any African language until [he and his men] were close to the coast on the return Journey” (Livingstone 1865:). Accounts of the trip costs at the end of the diary have early dates (4-9 August 1865), which suggest that Livingstone divided the notebook up this way from the beginning, using the two different text directions to separate the narratives from the notebook's other functions of calculations, lists, and other jottings. The cover (left; top in mobile), spine (center), and an insert note from Rev. 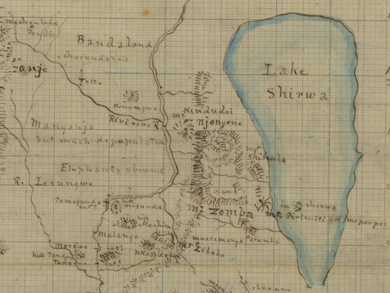 James McNair (right; bottom) from Field Diary I (Livingstone 1865:, , ). Copyright David Livingstone Centre. Creative Commons Attribution-NonCommercial 3.0 Unported. McNair's note summarizes the contents of the diary plus compares it to the corresponding segments of the Last Journals (Livingstone 1874). Covered in damaged green silk, this hard-back book has a side binding. Livingstone writes mostly in blue pencil, with the occasional grey pencil entry, and a few words and numbers in ink, perhaps added in later. Entries range from a few lines to a few pages, often separated by a horizontal line across the page. The frontispiece includes a summary of the diary’s contents, written by Rev. James McNair, founding of the David Livingstone Center in Blantyre, Scotland. Written in the late 1940s- early 1950s, the summary notes that there are dates that do not correspond with Horace Waller’s edition of Livingstone’s Last Journals (1874). On the back inner cover, this field diary, like the others held by the David Livingstone Centre, bears a pasted-in bookplate from the Stirling University Library Conservation Project relating to a conservation effort from the 1980s. Though Livingstone brought a supply of top-bound pocket notebooks with him, this side-bound book is the one he chose to begin his final travels to Africa.